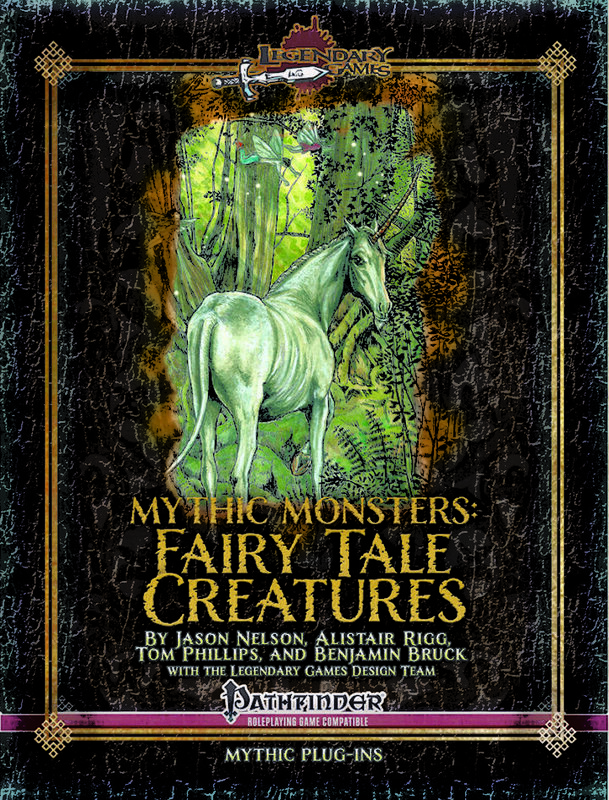 The 12th volume in our Mythic Monsters series, Mythic Monsters: Fairy Tale Creatures brings you a dozen and one celebrated storybook creatures, a few friendly, more of them malevolent, and every one dangerous. This product certainly celebrates the fey, but it incorporates a selection of monsters of many types inspired by fairy tales, often with a decidedly Celtic flair. From blarney-filled leprechauns and luminous pixies to terrible banshees keening their anguish and whether bringing succor like a unicorn or murderous spite like a redcap, these creatures bring the full flavor of the realms of faerie to your campaign. We have hungry green hags ready to gobble their victims living or dead alongside flitting faerie dragons that just want to have fun, bogeymen that use terror as a weapon and will-o'-wisps that feed upon it like sweet nectar. We also delved into the madcap tales of Lewis Carroll to bring you not only mythic versions of the frumious bandersnatch, jubjub bird, and jabberwock, but also a brand-new thirteenth monster for this collection, the strange and elusive boojum snark! In addition to these fabulous fairy tale creatures, this product includes a selection of non-mythic and mythic spells, including call woodland beings, faerie form, and fey crossroads, as well as fey-inspired mythic versions of existing spells! The 13 monsters contained herein, ranging in CR from 3 to 28, are updated for the mythic rules, and when we say updated we mean complete stat blocks, yes, but more than that every one has its own unique and exciting new mythic abilities, from a mythic green hag's grisly gobble and insatiable stalker to the death coach and immortal anguish of a mythic banshee! Download this 30-page mythic monster supplement today, and look forward to future releases in the Mythic Monsters line.